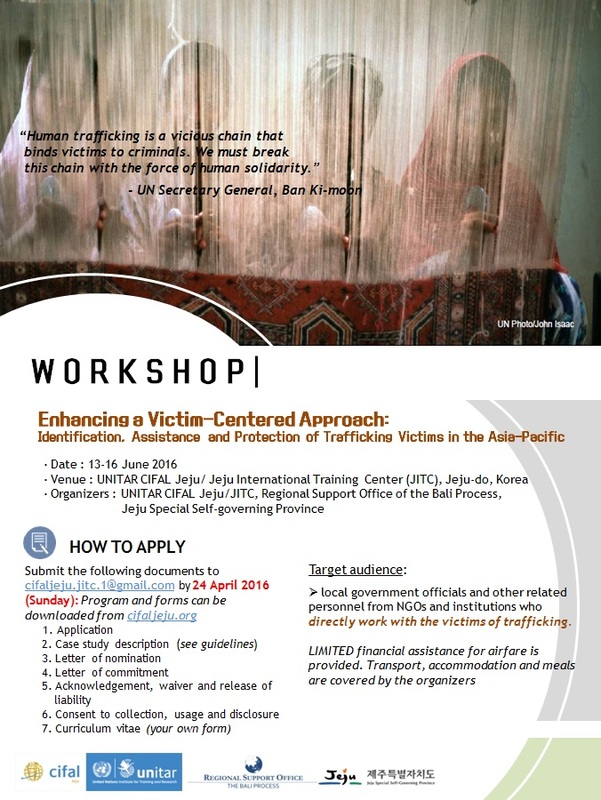 cifaljeju > HS (Past workshop info) > 2016 June 13-16: "Enhancing a Victim-Centred Approach: Identification, Assistance, and Protection of Trafficking Victims in the Asia-Pacific Region"
? be able to build professional networks, exchange information and knowledge.
? submit necessary documents on time, i.e., registration form etc.
? complete and submit pre-training readings and assignments, i.e. case studies etc.
? Application without required documents will not be considered.
? Participation is subject to approval of the application by UNITAR CIFAL Jeju/JITC.
? UNITAR CIFAL Jeju/JITC provides a LIMITED (please see the agenda) financial assistance with the airfare to Jeju-do, Republic of Korea.
? Local expenses (transportation, accommodation and meals) during the workshop will be covered.
? All other expenses are the responsibility of the participants.